King Canute at Point Wells! 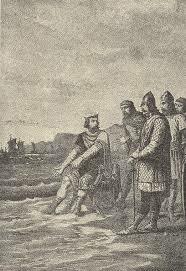 “Canute rebukes his Courtiers” by Alphonse-Marie-Adolphe de Neuville. Some thirty or more years ago a subdivision was approved north of Thames on what was a combination of old mine tailings and a rubbish dump. Subsequently the unstable land sunk, leaving the residential houses at great risk of inundation by the sea. The top of the seawall looks about 2.5 metres above the road level. Am I Alone in Thinking This is Dumb?? A large new house is being built barely 10 metres from the top of an eroding sand cliff north of the Omaha boat ramp and jetty. Sure there are several older houses nearby which have been there for 20 years or more, but this is a recently permitted new house.